The Ticketing add-on for Event Espresso allows you to customize your own tickets and create custom tickets for different events. Need to Buy a Support License for the Ticketing Add-on? Download the latest version of the Ticketing add-on for Event Espresso 3 from your Event Espresso account. 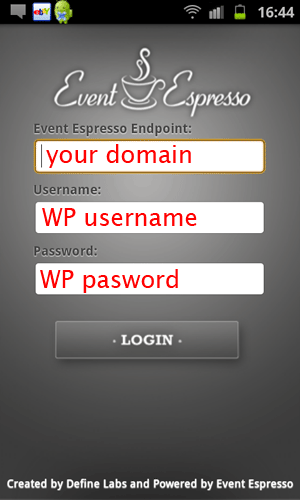 Login to your WP dashboard and go to Event Espresso –> Ticket Templates. Ticket Name – Enter the name of your ticket here. Select Stylesheet – Various styles are available. Select one here. Select a Template – Various templates are available. Select one here. Add a Logo – Click on Upload Image to upload an image that will be used on your ticket. Ticket Description/Instructions – Use this field to enter information that will be displayed on an attendees/registrants ticket. Be sure to save changes after making changes. Once your ticket template has been created, you can go to an event in the event editor and then select your ticket template and save changes. Event Espresso will then use this ticket template for this event. The Ticketing add-on will makes managing your event so much easier. Create tickets that can be printed or displayed on smartphones, and then use your own smartphone to scan the QR codes at the door. Speed up entry to your event by quickly scanning QR codes with your smartphone instead of ticking names off a list. Use Gravatar to display attendee photographs on tickets. Have multiple entry stations that synchronize in real-time. Go green! Attendees can display tickets on their own smartphones. Don’t pay for expensive equipment. 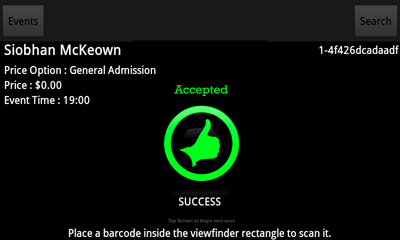 You can have automated ticket scanners all from a device you already own. Have fully branded tickets with your own logo. In most cases the basic template should suffice. 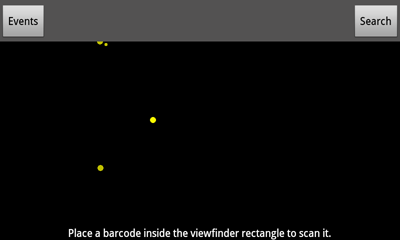 It will display details of the event, including the map, QR code, and Gravatar. However, in case you want to do some advanced editing, we have provided a list of shortcodes which you can use to customize your template files. These shortcodes cannot be inserted into the text area in the ticket editor. You can then insert shortcodes into the PHP file and create your own templates, without having to worry about them being overwritten when you update the ticketing add-on. The custom questions and answers can also be output using shortcodes. To use this feature, you will need to wrap the custom question text with ‘[answer_’ and ‘]’ within your HTML file. 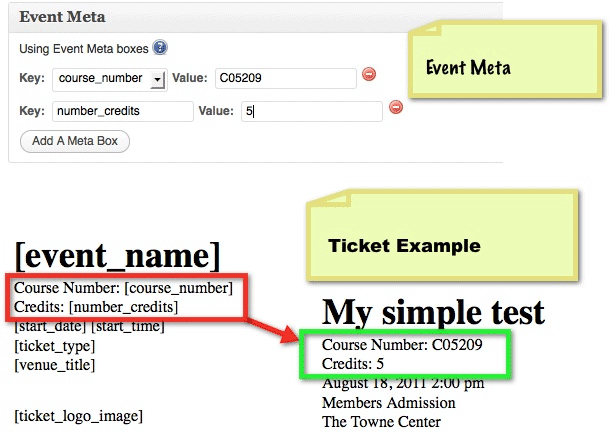 If you have added event meta to your events, and would like to display the values in the tickets templates. Just use the key names of the event meta to display the values, by adding square brackets (‘[‘ and ‘]‘) around the key names. Please install the Event Espresso Espresso JSON API Add-on to connect your iPad app to your server. Now lets get started on this ticketing guide for Event Espresso 3. Ensure that the Espresso JSON API add-on in installed and activated on your site. Also ensure that the Ticketing add-on is installed and activated on your site. Go ahead and create your event using the event editor. If you need help creating your event, then take a look at this example of how to create an event using Event Espresso 3. 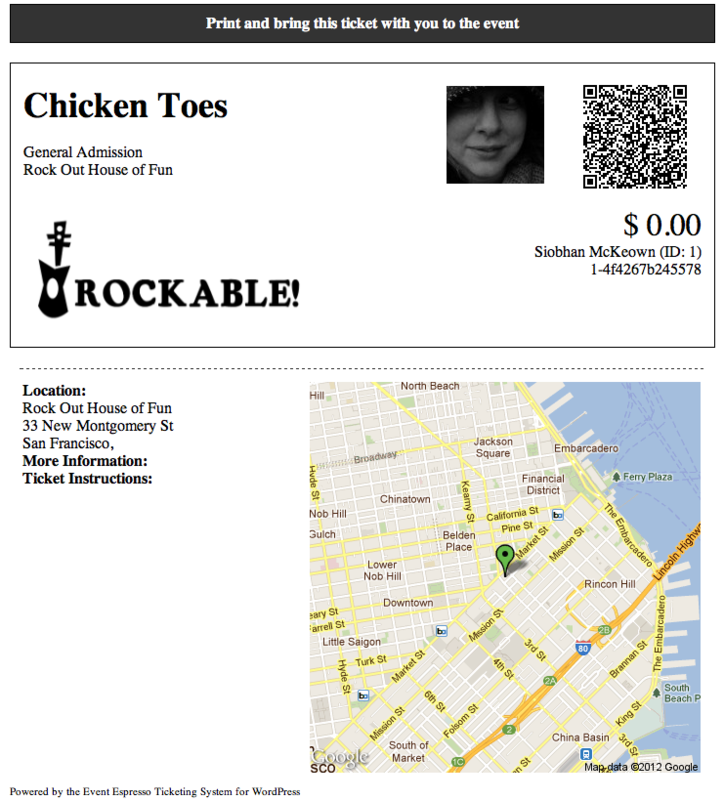 My event is a gig for a rock band called Chicken Toes. Ticket Name – Enter the name of your ticket here. This is what will display in your event editor screen’s ticket template selector. Add a Logo – Click on Upload Image to upload an image that will be used on your ticket. Browse to an image on your computer, select it and begin the upload. Then click on the Insert into Post button. Browse to Event Espresso –> Event Overview and click on your event. You’ll then be brought to the event editor with information for your event. Scroll through the meta boxes on the right hand side until you find the Custom Tickets meta post. Select your ticket from the dropdown menu. Add the ticket link to your registration confirmation email. You can find this under Email Configuration at the bottom of the event editor screen. Choose to use a custom confirmation email. 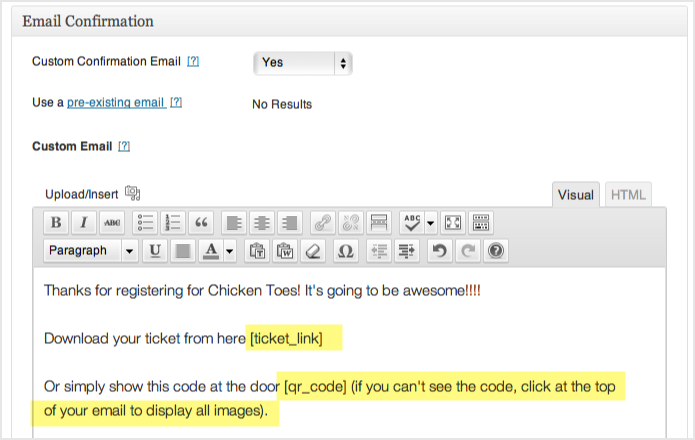 Create your custom confirmation email and insert the [ticket_link] shortcode. You can also add the [qr_code] shortcode. This will display the QR code in the email so attendees can simply print the email, or show it on their smartphone to get entry to events. 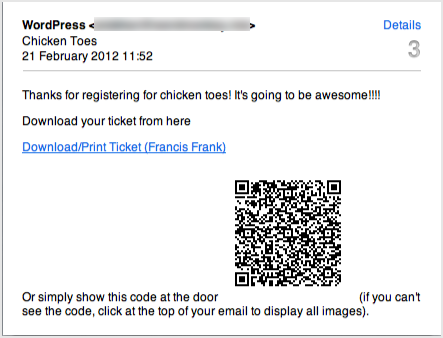 Now when your attendees register, they’ll get an email with a QR code and link to their ticket. This is what your ticket will look like! It’s now time to set up your iPad, iPhone, or Android smartphone with one of our mobile apps. Download and install the app on to your smartphone. Enter your website’s address (URL), WordPress dashboard (WP-admin) username, and password. Once you’re logged in you’ll see a list of your events. You’re now ready to start processing your attendees. Touch the event to start scanning QR codes. 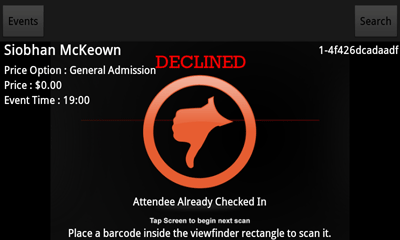 The app will scan your attendees tickets, and let you know if their ticket is valid. It will also automatically update your attendee list in the WordPress dashboard. Once you have scanned an attendee’s QR code, the person will be marked as having attended and will not be able to use that code again. If anyone tries to use a ticket a second time it will be flagged up as declined. This prevents duplicates from being used. You’re now ready to use your very own smartphone as a powerful piece of ticketing processing technology. How awesome is that?! I can’t login to the mobile app! Please ensure that Event Espresso 3, the Ticketing app, and the Espresso JSON API add-on are up-to-date. Next, be sure that you are using the Event Espresso HD App. User roles of Administrator and Espresso Master Admin are the only roles that can login to the mobile apps. My attendees are not receiving a ticket link in their registration confirmation emails. Did you add the ticket link shortcode to the event registration confirmation email? If not, take at the tutorial shown earlier in this article.